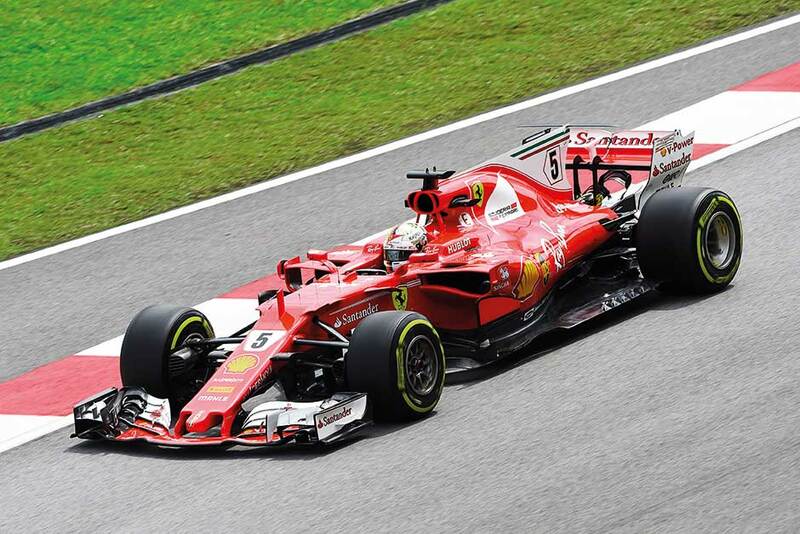 Sepang, Malaysia: Sebastian Vettel smashed the all-time Sepang lap record Friday as Ferrari put the pressure on Lewis Hamilton before a track fault brought an early halt to Malaysian Grand Prix practice on Friday. Vettel clocked 1 min 31.261 sec around the 5.543-kilometre circuit on his qualifying simulation run in the second session to smash the old record of 1:32.50 set by Fernando Alonso in 2005. Vettel’s Ferrari teammate Kimi Raikkonen was second, six-tenths of a second adrift. The Red Bulls of Daniel Ricciardo and Max Verstappen were third and fourth on a frustrating day for Mercedes’ championship leader, Hamilton who was only sixth fastest with Valtteri Bottas seventh. Hamilton had been on just his 10th lap of the afternoon when he took too much speed into turn eight, resulting in a sideways excursion into the gravel and a wrecked set of soft tyres. Hamilton did manage to avoid beaching the car and was able to limp back to the pits, where his mechanics removed the nose and started making frantic changes to the set-up. When he did re-emerge with 40 minutes of the session remaining his car appeared still to be handling erratically, and his first timed lap was fully 1.4 seconds down on Vettel. Then he suffered the embarrassment of being overtaken by the immensely improved McLaren of Alonso, who was enjoying his best practice of the season in fifth on the timing sheets. Moments earlier his teammate Valtteri Bottas, struggling with his own set-up, had also ploughed into the gravel at turn 11 although he too was able to get the car back to the garage. The session ended 20 minutes early when Romain Grosjean hit a loose drain cover at turn 9, ripping his rear tyre apart and throwing his Haas into the barriers at around 200kph. The Frenchman was lucky to be able to walk away but with no time to repair the offending part of the track the session was red flagged and then called off 10 minutes early. Rookie Pierre Gasly also suffered a scare when he came into the pits with huge amounts of smoke billowing from the rear of his Toro Rosso. But it turned out to be just a minor oil leak and he was soon on his way again. Earlier, the first 30 minutes of the morning practice had been lost because of heavy rain. The two Red Bulls set the pace as lap times tumbled towards the end as the track dried and drivers switched to intermediate tyres. Verstappen managed just 11 laps but his best at 1 min 48.962 sec was 0.757 sec quicker than Ricciardo. Alonso was third, two seconds adrift of Verstappen as the Red Bulls proved untouchable in the wet. Hamilton did not bother to leave the shelter of the Mercedes garage until 30 minutes from the end of the session, and could only set the sixth fastest time, three seconds behind the leading Red Bull and eclipsed by both Ferraris. Vettel was only fifth quickest in the morning, four-tenths slower than Ferrari teammate Kimi Raikkonen.